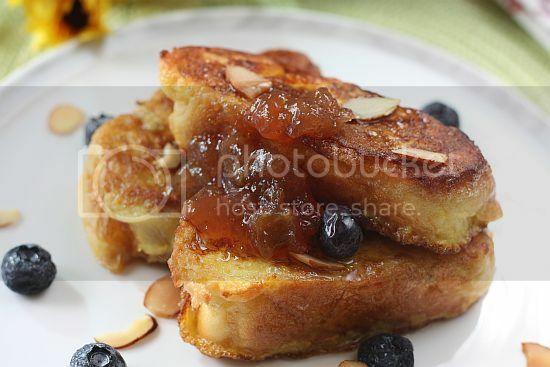 There is really nothing better than waking up on a Sunday morning to be welcomed by a plate of delicious warm french toast with maple syrup, fruit and a dollop of my faviourite jam on the side. I love having breakfast such as this. In fact I think an English breakfast gets me moving faster than an Asian one! Heh I'm Asian right so I should be having my fried beehoon, or porridge or chee kueh .... shouldn't I? When on holidays, the best meal of the day for me would have to be breakfast, especially a buffet spread (ok I love stuffing my face). I thoroughly enjoy moving from one station to another, spread out with fresh fruit, cereal, cold cuts to the guy who keeps flipping sunny side eggs to scrambled eggs. My knees go jello at the sight of this and I would methodologically start with my fresh juice, to fruit and work my way to the main spread of eggs, sausages and pancakes. Well it's been said that breakfast is the most important meal of the day, so what's your favourite breakfast dish? 1) Place eggs, milk, cream salt, vanilla extrct, cinnamon and nutmeg into a bowl. Whisk to combine well. Soak the brioche into the egg mixture. 2) Preheat a large frying pan over medium fire. Add about 1 tablespoon oil and about 1 1/2 tablespoon butter. 3) Fry the brioche for about a minute of each side until golden brown. Do not overcrowd your pan. Repeat with the remaining slices. 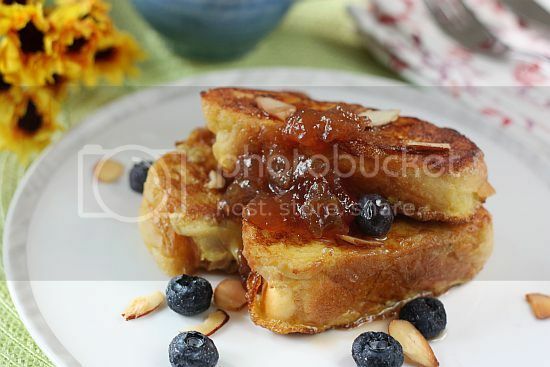 4) Serve immediately with maple syrup, jam and your favourite fresh fruit. Nothing beats comfort food and this is one of those for me. Enjoy your weekend. Ooh, I love French Toast too! Yours have so many added spice. I shall try that next time. Thanks for sharing! To be true, I enjoy Asian breakfast more than Western ones ;), but I do crave for rolls with ham or warm toast with butter from time to time too. I guess it's because I live in Germany now that I always want something Asian most of the time ;). Bready things top the breakfast list--biscuits, pancakes, waffles. And cheesey things. 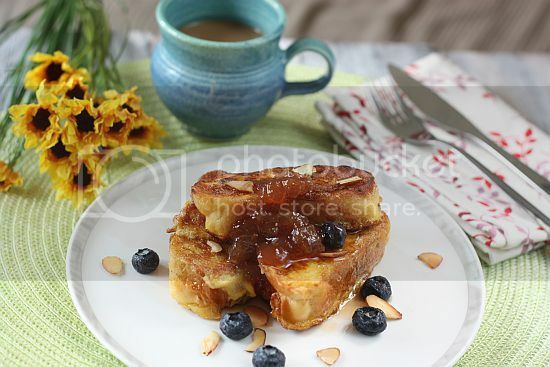 :) French Toast is nice because it's warm, sweet and cripsy. I like nasi lemak for breakfast , but once in a while, I will Western breakfast too . This look really nice. yes! this is the best thing to wake up to! I like french toast too... You remind me how long I haven't have this. :) Thanks for sharing! I too love French toast. Your pictures are beautiful too! Sounds like a wonderful way to start the day. 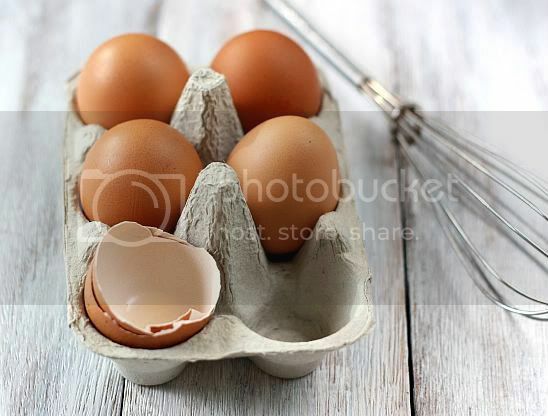 Your photo of the eggs and whisk is just beautiful! Personally, I haven't met a French Toast I didn't love! (Especially if it's accompanied with a mimosa or 2...) I like this recipe the best because it's pretty easy and turns out super fluffy!